As you stroll up the walkway through the landscaped front yard toward the villa, you'll immediately recognize the Italian influence. The low-pitched rooftop complimented by decorative eaves typical of Italian style hints at the elegant layout and decor you'll discover inside. As you're entering Tuscany Hills through the arched entryway, you'll quickly notice the solid wood door. It's quality like this you'll find throughout the entire villa. Stainless steel appliances, granite countertops, solid wood furniture, and rod iron hand rails are just a few of the components that make up the interior decor. To the left of entryway you'll enter the main living area of the villa. 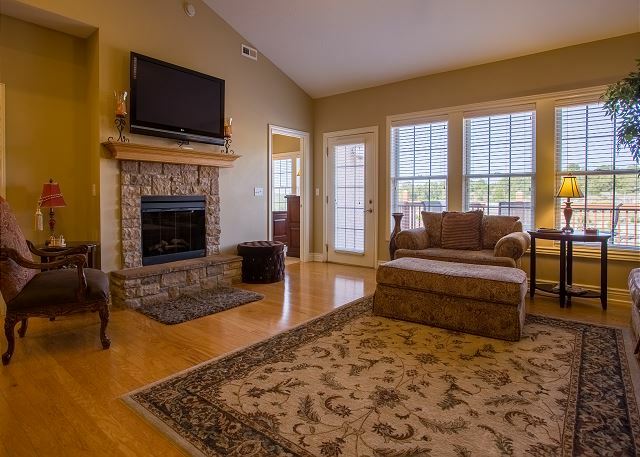 This spacious living room with fireplace provides the perfect setting to unwind and relax during the evening hours. 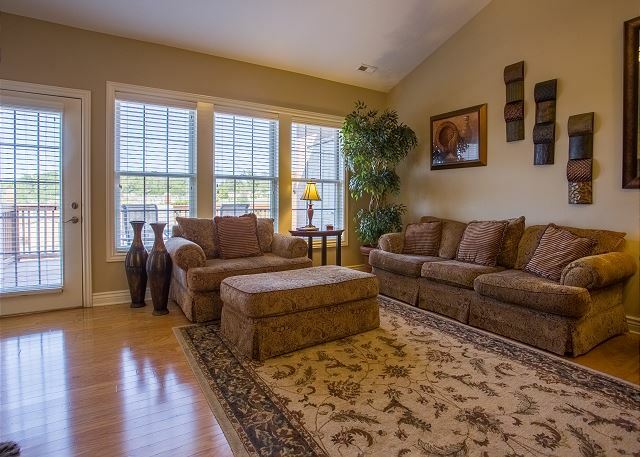 Complete with a beautiful coffee table, ample seating, and a flat screen TV, this room screams comfort! When morning arrives the next day, you'll be cooking up breakfast while planning the day with family. No worries though. 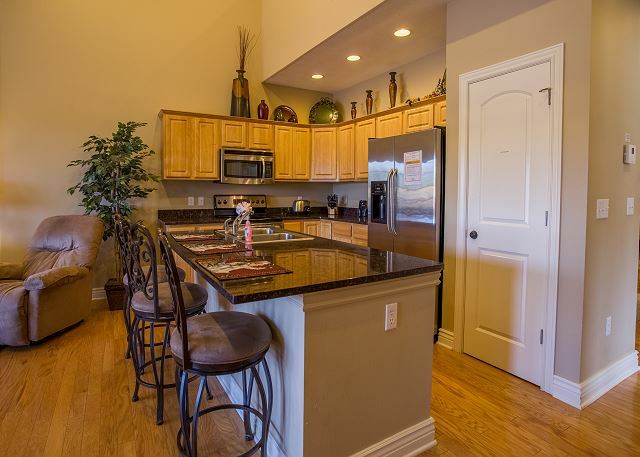 The open floor plan lets you talk with family seated in the living room or island bar while you prepare breakfast. 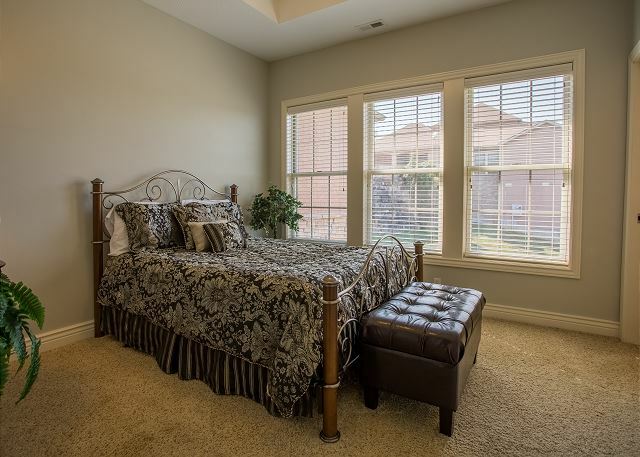 There's no shortage of comfortable beds in this 3 bedroom villa. 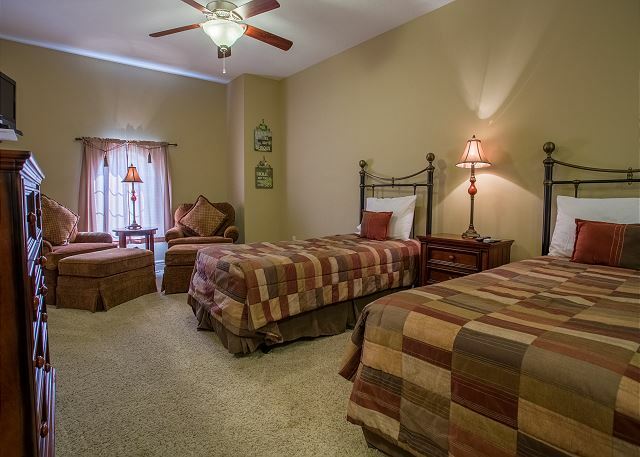 You'll find a solid wood, king sized bed in the master bedroom, a rod iron queen sized bed in the guest room, and 2 twin sized beds for the kids in the loft bedroom. In summary, if you're looking to vacation in a stylish, spacious rental for a very reasonable price, then look no further. You will love (amore) it! 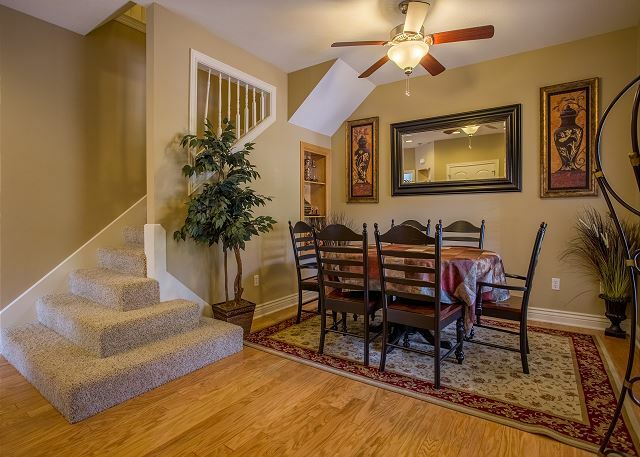 Had a family vacation at Branson over the Thanksgiving week and this house was very nice and conveniently located. Great time in Branson with Family! We had such a great time in Branson. 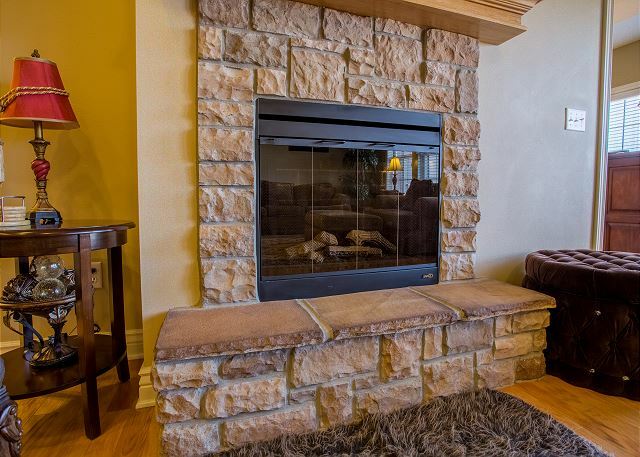 The condo was located in a nice quiet area on the edge of town, so perfect for our family. We had a nice time staying at this home. It was very clean and we have stayed in this neighborhood two years in a row and just love it. You can walk to the pool which is rarely crowded. It is about 8 minutes from Branson which is perfect. Our only negative would have been the driveway because our van scraped on the bottom because of the angle of the driveway. We figured out after the first few times to unload everyone but my husband who was driving and it didn't happen. We would rent this home again. Thank you for the review, Tammy. We're glad you enjoyed your stay. Come back and see us soon! The location was great and the villa was spacious and clean. I do have some feedback: 1) Calling the WiFi "totalhighspeed" is misleading as it was very slow. I did have to some work on the trip and a file would never upload to Dropbox. When checking the download speed (not even upload) it was 550Kpbs, not even megabytes or gigabytes. A better service needs to be offered. 2) All staff needs to be informed of the amenities. I specifically asked through the VRBO app if all three bedrooms had TVs and the response back was, “Yes.” In addition, the afternoon of our arrival, I did receive a voicemail that they were having issues with DIRECTV in the loft room. Okay, I understand but there is no TV in the second master bedroom. After sending another message, the response, “That is correct.” Had I known, I would have brought a 32” TV with me. 3) A pool pass was provided but no information (map) on the property. 4) Since this is villa or duplex, the front porch is shared. The neighbor put bird spikes (actually zip ties) above the arch. This property needs it as there was a bird and nest with birds flying around and bird droppings everywhere. Thank you for the review and your feedback, Renee. We are glad that you enjoyed your stay. Total High Speed is the name of the company that provides internet service to this unit. Since this home is outside the area that our local cable internet covers, most owners who choose to provide wi-fi access have to use a satellite internet provider which tends to be slower but we will check to see if there are any higher speeds offered. I apologize for the miscommunication regarding the televisions in all of the bedrooms and will address this with the staff. I also apologize that there was not a map of the area in the unit. Typically, the maps are located in the guest book but from, time to time, someone will remove it and we must have overlooked that it was missing during the check-in inspection. We will also add the map to our final confirmation so that all guests have access to the area map. Very close to Branson and all of the things we wanted to do. The new airport is close by also. Never heard a plane. House was very nice. Loved the 2 car garage to park the Harleys in. 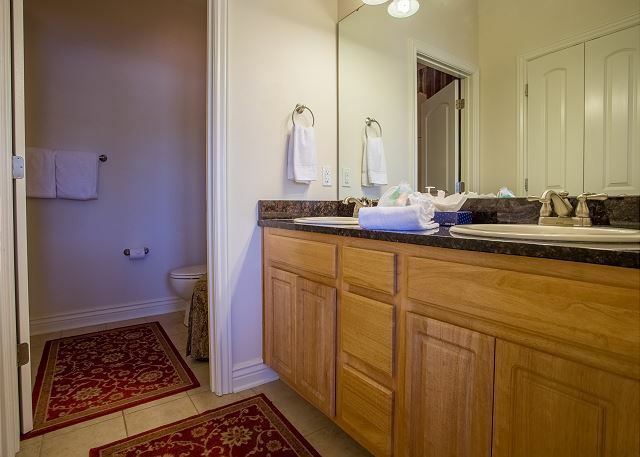 The condo was perfectly suited for our needs... clean and well-equipped. The setting of the neighborhood is lovely. If I were to try to design a vacation home away from home that could give my son his own space, a place for my mother in law and her dog and a room for me and my husband with the right amount of spaciousness and amenities, I would not come close to the Tuscany Hills villa, because I wouldn’t have thought of all the things someone thought of when they prepared this destination. With very few minor flaws, this property was just right. If someone lived in it everyday, they would notice the imperfections, but for a few days, everything was fine. This is our 2nd time rented the villa and it is always nice. My boys are happy that the up stairs has a window cover now.Just an FYI the couch needs to replaced or fixed. If you sit at the end, it sinks in like there's no springs. Just test it out you will see. Other then that we love the place. The Villa my family and I rented to spend some time together before Christmas day was a wonderful experience. The house was just the right size for all of us and very clean. It had all the amenities that we could possible want. Our stay was excellent! Was in a great quiet location very close to everything we wanted to do. Home was clean and nicely decorated so you feel like your at home. Rental staff were very kind and best thing was we got to bring our fur kids!!! Will be back to stay again soon!!! I was very pleased and relieved how nice and how clean it was. It was the best pet friendly place I have stayed in vacationing with our dog. I would definitely stay there again & recommend it to friends & relatives. Hello, Roger! We're so glad that we were able to exceed your expectations, and your furry friend's as well! 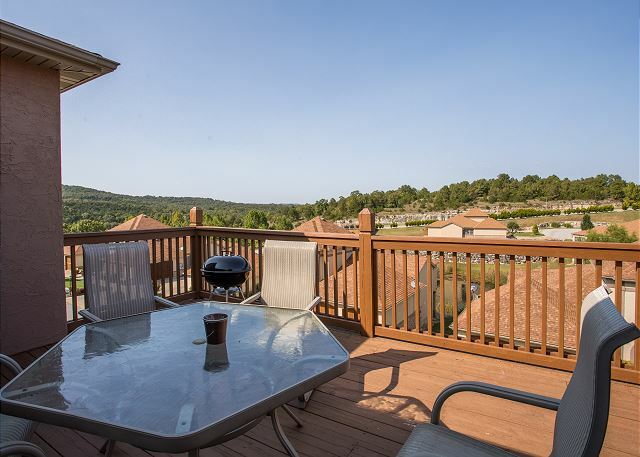 We can't wait to help you find the perfect rental for your next Branson vacation, and you have a special returning guest discount waiting for you when you come back. I would highly recommend this condo to anyone. It was beautiful and so comfortable. We loved out time there! This place was a quiet little getaway that was in a beautiful community just minutes away from nearly everything. Thank you for the service! It's our pleasure, and thank you for the feedback! We're really glad to hear you enjoyed your stay, and we hope that we hear from you again for your vacation needs. Well stocked kitchen. WIFI would have helped and extra towels for the women's hair. It was quiet and clean. Dishwasher wasn't cleaning the dishes so I had to hand wash them. It wasn't dispensing the soap. Overall it was very nice. Way better than hotel rooms. This home was beautiful! Very comfortable, plenty of kitchen and paper supplies. Very close to all the popular sites. Very easy to find. We had a wonderful time, and the whole time we felt right at home. Thank you for helping us achieve this experience. my only wish would be a cheap curtain up stairs on the window. Excellent property very well stocked everything we needed was there clean and comfortable we had a wonderful family reunion there. 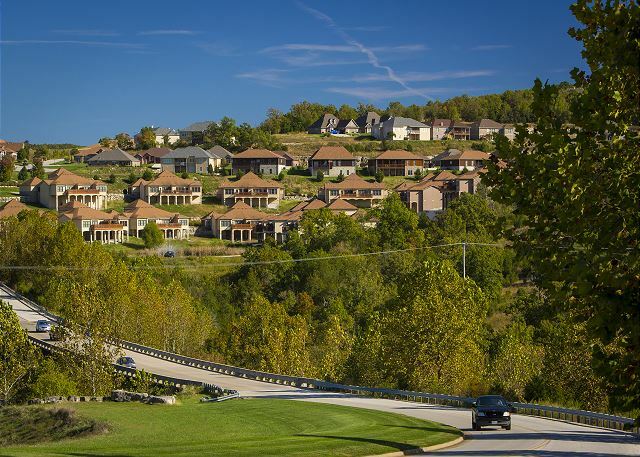 Great location just a few minutes from Downtown Branson, very quiet and peaceful. Would definitely come back. We really enjoyed our stay here. We stayed here with 2 grown children and 2 teenage grandchildren. Beds were very comfortable. Great view from the deck. Very clean and well maintained. Only complaints were we only given one towel each for the 3 day stay. Also should allow a check out time at 11:00 instead of 10:00. It worked out okay. We had a great time. Nice relaxing place. Out if the way of the hustle and bustle but not too far to run in to enjoy activities. Are First family trip to Branson,Mo! We had to idea of what we were getting into except from the photos from the web site, and boy were we all surprised! From the highway to the house was very pretty but when we got to the house even my twin 3 year old girls were so Happy! We had 4 kids and this home was prefect for us! We would go see the attractions (Did all we could!) but after I would ask if they were ready and all the kids would say yes lets go house! We couldnt Thank you enough! Very nice property. Our family had a lovely time and this property offered us a place off the beaten path where we could relax and unwind. Only thing I had a difficult time with was the curb entering the driveway. Curb too high resulting in bottoming out on my car. Overcame the obstacle, but still need to have the undercarriage inspected. We could not have had a better experience. It was so nice to be in a home for the week. Hopefully we can return next year. Fantastic location and gorgeous home. Our home was very beautiful. I recommend this place to anyone. We enjoyed our stay and plan on returning again in the future. Great location and beautiful scenery. We loved it! We brought family from California to Branson for first time and they loved it! The house was very comfortable and clean. We would definitely stay here again! We enjoyed our stay in Tuscany Hills. The decor was beautiful, accommodations For two couples great, living room very comfortable and beds were comfortable. Two things to improve: pocket door on powder room bath did not work and we found house numbers very hard to read. We would suggest large reflector numbers between the garage doors or on lamp posts. Also consider matching lock box code with garage door key pad. Home was very clean and nice amenities supplied. Spoiled us for staying in hotel when traveling with others. a one week stay with family. The villa was very clean and an overall nice stay. If you are planning a trip to Brandson, this is the way to do it. It is so much better and more relaxing than staying at a hotel and the accommodations were nothing short of amazing. The only thing that would have made it more perfect would have been wifi. The Villa was awesome, very clean, comfortable and spacious. Bring food and clothes everything else is furnished. 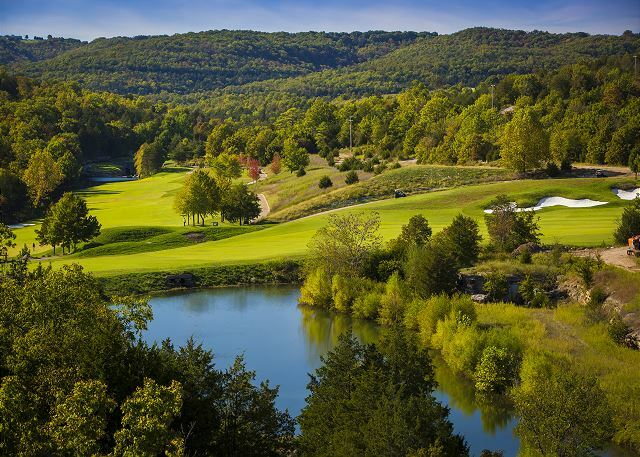 Location is very quiet in the scenic rolling hills of the Ozarks, only about 10 min from Branson or Table Rock Lake. Deck needs some upkeep and BBQ grill needs replaced. 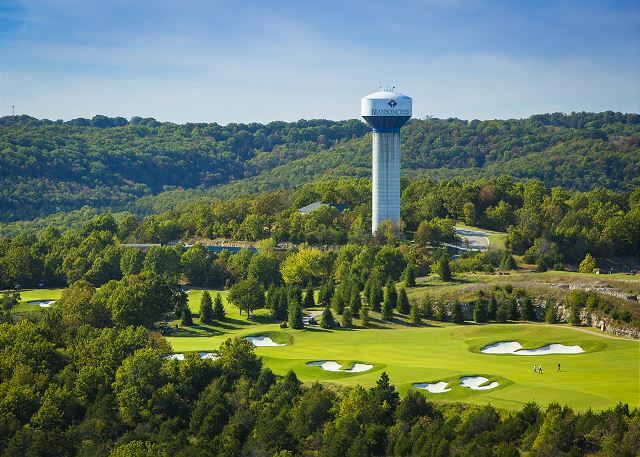 Another great golf trip to Branson; we really like the property, close to the pool; golf courses close by; a nice redo of Branson Creek and pending rehab of Murder Rock. The deck on the unit needs to be stripped and restained or painted; and the outdoor charcoal grill has a huge hole in the bottom and should be replaced with something a lot sturdier, say a Weber. 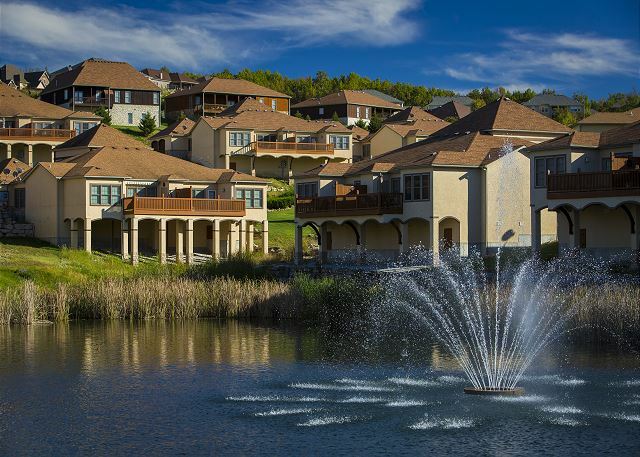 All in all, it is our favorite place to stay in Branson. We'll be back. We have rented many times from owners and mostly have had good luck. We were very pleased with this villa. 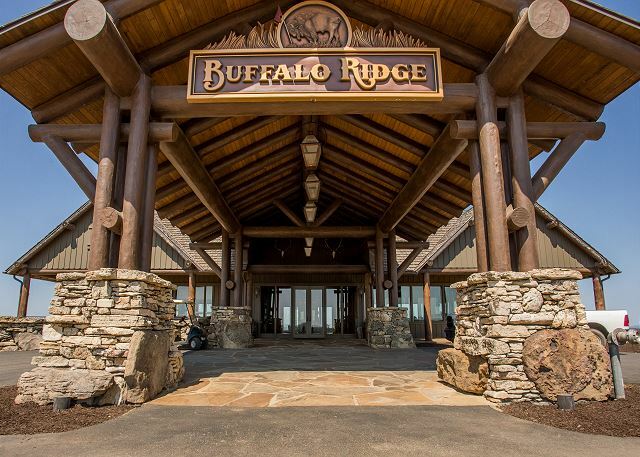 The location is just a 5 minute highway drive from the busy Branson areas. The villa is located in a well kept scenic neighborhood. We are use to living in an upper scale home so renting this villa was no disappointment. Its well maintained and very nicely decorated. The space is so much more than a hotel. They have a community pool that is walking distance but it is very small. We were able to bring our dog and that is a wonderful plus for pet lovers. Thanks for letting us staying in your wonderful home. We enjoyed our stay. 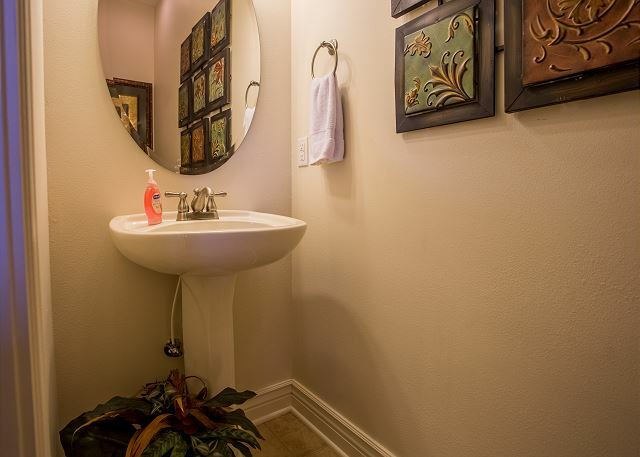 The condo/townhouse was very clean with every amenity you could possibly need. The only critiques I would share are the entrance to the Branson Creek is not lighted at night. We also would have enjoyed wifi. The condo was extremely clean and please note my standards are very high. The only thing was the front porch entrance had not been swept and was full of leaves and debris. This lead to a not good first impression. I was pleasantly surprised after entering to find it so clean. If you're in the Branson area, this is a great place to stay. Beautiful view, located near wonderful golf courses, and across the way from the future site of a winery. What could be better?! The home was spacious,clean and beautifully decorated. We had a wonderful time. Thanks, Nelda. We're glad you enjoyed your stay. Overall everything was in pretty good condition. I wish they'd add Wi-Fi as I don't know if I'd stay there again if they don't. The dog barking next door was a concern, but ended up not being very intrusive. Thank you for your review, Jeff. As all of our properties are individually owned, the owners decide on the amenities, furnishings and décor that fit their needs and tastes. 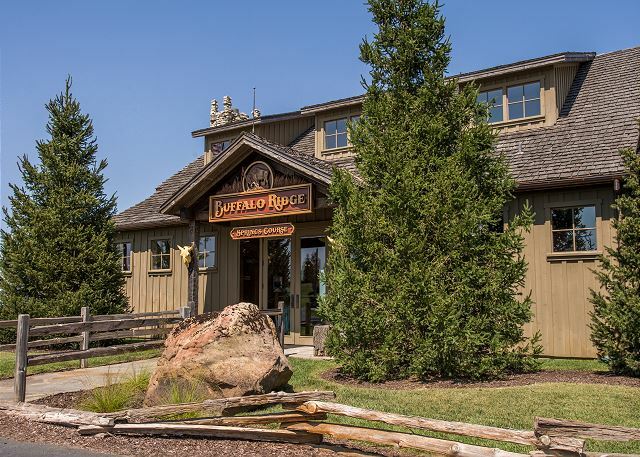 We will definitely pass your review along to the owner in regard to adding Wi-Fi but keep in mind that we have a number of other properties that do have Wi-Fi access when you are planning your next trip to Branson. This is even a searchable feature on our website because we understand that this is very important to many of our guests. Loved this place. Great place for a family to stay. Thank you for the review, Julie. We're glad that you enjoyed your stay. there was no WIFI which we made that a requirement when we were booking it, and was told that there would be free wifi!!!! !there was no wifi in which we had to go to starbucks in order to get work done. I apologize for the misunderstanding regarding the wi-fi access in the vacation rental you were in. Typically, our reservationists are very good about identifying a guest's needs and making sure that they are in a unit that fits those needs. As much of our business is due to repeat guests and referrals, we would not deliberately place someone in a property that does not meet their requirements. Once again, I do apologize and hope that when you return to the Branson area, you will allow us to correct this oversight as it seems that overall, everything else was good with your stay. Thank you, JoAnn. We hope to see you back in Branson soon! Rating for our stay is 5 ,location is also 5 we were very happy with location .In regards clean property I would give a rating 4 .I would recomend this property to my friends and family.Thank you! Thank you for your review, Mirveta. We are glad you enjoyed your stay and hope to see you back soon! We had a wonderful time at the Tuscany Hills Condo , but the maintenance of the trash service was an issue. The first 2 days we killed a total of 30 flies and the unit smelled of trash because of the last tenants trash. We would love stay at the condos next year. I would just recommending whenever new clients come in the trash from the previous clients should be disposed so you do not have sanitation issues with flies and order. Thank you for your review, Kenneth. I apologize that the trash was not disposed of properly by the previous guests or the housekeepers. We never want something such as this to impact a guest's stay and the beauty of this property. I have passed this along to the Operations Supervisor assigned to this unit to discuss with the housekeeping staff and to monitor. Close to everything. Very nice unit. Wish it would have had wi-fi but overall, great space. Thank you for your review, Kim. We will pass the request for wi-fi along to the owner of the unit but we are glad you enjoyed your stay. The only problem we had was the driveway contour made the car scrape on the underside. In fact, we parked on the street several times. The group that made our reservations were very nice to deal with, especially Donna. For a golfing group, no "Golf channel" on the TV network is a minus. More precise description of the sleeping arrangements on the website would be nice. Overall positive experience. Enjoyed this villa, clean comfortable and easy to access.